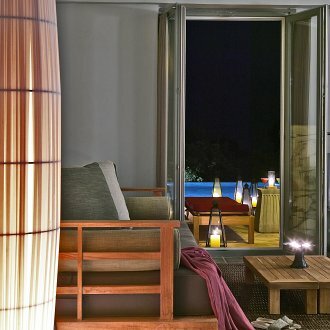 Suites in Greece; what will i find? Greece holiday apartments is a complete Travel Guide for the Greek islands and Greece. Find a list of hotels in Greece, studios, apartments and villas for all budgets and Greek hotel special offers in Greece, see maps and photos of Greece. We often come across a dilemma, the choice between a standard room and suite, when selecting a room type for our holiday accommodation in Greece. Price for the suite will definitely be higher, sometimes much higher. The main question is: will i get what i am paying for? More and more hotels and small family units characterize part of their rooms as suites. But are they really suites? Unfortunately, this is not always the case. Tourists find themselves paying a lot more money, simply to get a standard room with perhaps an LCD TV or a bathtub and if they are lucky enough, it may be slightly bigger. The difference between the room and the suite is sometimes hard to see. However, don't get disappointed. Most newly built hotels have lovely, spacious suites with extra facilities and special decoration worth paying for. It is essential to clarify the extra features of a hotel's suite by asking how big it is and what extra facilities it offers, compared to a standard room. Talk with the hotel owner or your travel agent so that you do get what you have paid for.